The Apple Watch is the best-selling smartwatch on the planet, and there isn’t even a close second. It’s nowhere close to being perfect, however, and many people out there are looking for other good options. And of course the Apple Watch doesn’t work with Android phones, so it’s not even an option for the billions of people out there who use Android. 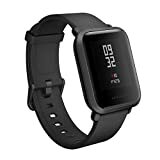 Check out the Amazfit Bip Smartwatch by Huami. It works with iPhones and with Android phones, it has GPS for run tracking, it has sleep tracking, it has constant a heart rate monitoring option, and it features battery life that lasts for up to 45 days on a single charge! It normally sells for $100 which is already an insane value, but right now it’s just $65 on Amazon. Go the Distance: Use the Amazfit Bip for up to 30 days on a single 2.5-hour charge. Don’t Miss a Beat: Optical heart rate monitoring and built-in GPS allow you to accurately track in real-time your steps taken, distance traveled, calories burned, and quality of sleep. Special sport modes (running, treadmill, cycling and walking) give you even more detailed insights into your most frequent activities. Satisfaction Guaranteed: Buy with confidence. Amazfit offers a 30-day refund policy, and 12-month new replacement warranty.